After a long hiatus, I am finally back to blogging! The clinical doctorate program was more intense than I anticipated, which left little time for cooking, much less writing about it. Thank God my husband is a good cook! During one of the most difficulty stretches, my blog started receiving hundreds of spam comments every hour. Fortunately, they weren’t getting through, but it was enough that I had to take down the blog for a couple of days, and lost all my photos in the process. At least the recipes aren’t lost! To celebrate my graduation, I signed up for a solar cooking class. Registration included a solar oven. Little did I know that my husband had already ordered a different solar oven for me as a birthday gift. My plan is to try different recipes in both ovens, to see how they compare. 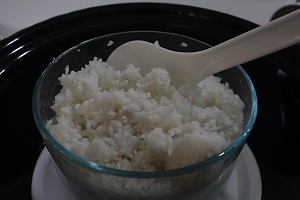 For my first trial, I cooked white rice on a partly cloudy day. The Solar Hot Pot is the oven that came with my class. The oven consists of a black metal bowl inside a glass bowl with a glass cover. The pot sits inside an aluminum reflector. The rice cooked in glass dish inside the black bowl. My husband bought me the Sunflair Solar Oven. This oven is a fold out oven made out of the same material as a windshield shade. It came with two collapsing plastic pots. This would definitely be better on a backpacking trip. The rice took approximately 2 hours to cook in the Hot Pot, and about 3.5 hours in the Sunflair. 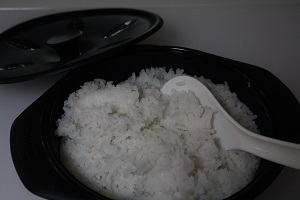 The rice was good from both-stickier than what comes out of our rice cooker. 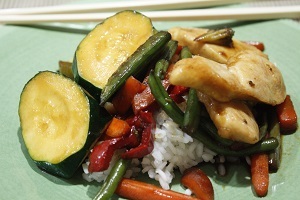 I served the rice with one of our favorite stir fry recipes. 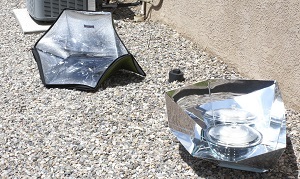 My plan is to try out the solar ovens with veggies from time to time. I’ll keep reporting back! 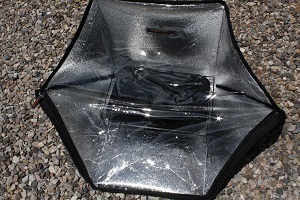 I would love to hear from others who have tried solar cooking. What was your experience? 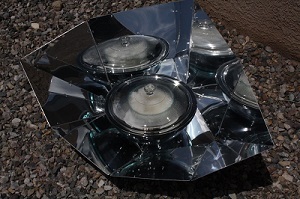 This entry was posted in Main Dishes and tagged solar cooking on May 11, 2015 by Ruth. Beets. A delicious vegetable, but they turn EVERYTHING red. Including whatever other ingredients are mixed in with them. Unless, the other ingredient is green. I used my go to stir fry recipe for this; with chicken, broccoli, beets, and carrots. Looks pretty festive, doesn’t it? 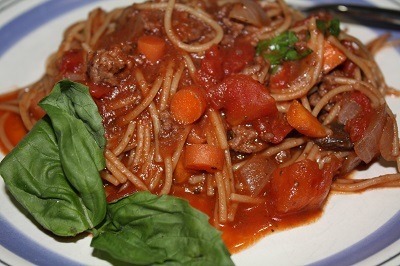 This entry was posted in Main Dishes and tagged beet greens, beets, broccoli, carrots, garlic, onion, Oriental on December 23, 2013 by Ruth.